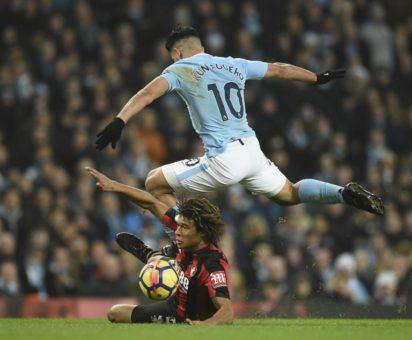 Manchester City racked up a 17th consecutive Premier League victory after Sergio Aguero’s 100th and 101st Etihad Stadium goals inspired a 4-0 win over Bournemouth on Saturday. Aguero scored twice and set up Raheem Sterling as Pep Guardiola’s side made it 18 wins and one draw in the first half of the season and provisionally opened up a 14-point lead at the top of the table. Harry Kane equalled the record for Premier League goals in a calendar year with a hat-trick in a 3-0 win at Burnley that lifted Tottenham Hotspur to fifth place, while third-place Chelsea drew 0-0 at Everton. City are now two wins off the record for consecutive victories in Europe’s top five leagues, which was set by Guardiola’s Bayern Munich in 2013-14. They have already become the first team to score 100 goals in the English top flight in a single year since Liverpool in 1982. City took a 27th-minute lead when Aguero met Fernandinho’s cross with a diving header to bring up a century of goals in front of City’s fans since his 2011 move from Atletico Madrid. The Argentina striker’s dinked pass set up Sterling to smash home City’s second goal — and his 16th of the season — in the 53rd minute before Aguero headed in his second. City substitute Danilo completed the scoring late on, rubber-stamping a victory that sent Bournemouth into the relegation zone. Tottenham bounced back from their 4-1 loss at City to win at Burnley, who drop one place to seventh. Kane opened the scoring with a seventh-minute penalty at Turf Moor after Kevin Long was adjudged to have fouled Dele Alli and added two clean strikes in the second half. He has now scored 36 league goals in 2017, equalling Alan Shearer’s Premier League-era record, with a home game against Southampton on Tuesday still to come. “I am aware I’ve equalled Alan Shearer’s record,” Kane told BT Sport. Everton continued their improvement under new manager Sam Allardyce by extending their unbeaten run to six league games with a dogged 0-0 draw at home to champions Chelsea. “I think this result is unfair,” said Chelsea head coach Antonio Conte, whose side hit the bar through Everton defender Ashley Williams. Chelsea will fall five points below second-place Manchester United if Jose Mourinho’s side prevail at Leicester City in Saturday’s late game. Swansea City remain four points adrift of safety at the foot of the table after drawing 1-1 against Crystal Palace in their first game since the sacking of manager Paul Clement. Palace, now unbeaten in eight league games, took the lead through Luka Milivojevic’s penalty just before the hour. But Swansea, with player-manager Leon Britton in the dug-out, levelled 13 minutes from time when Jordan Ayew drilled home from outside the box. Joe Allen starred as Stoke City registered a timely 3-1 win over second-bottom West Bromwich Albion to ease some of the pressure on manager Mark Hughes. Wales midfielder Allen scored and set up a goal for Eric Choupo-Moting, with Ramadan Sobhi adding a late third after Salomon Rondon had replied for West Brom, who have gone 18 games without victory in all competitions. Newcastle United climbed out of the relegation zone after ending a nine-game winless run by edging West Ham United 3-2 in an entertaining encounter at London Stadium. After Marko Arnautovic gave West Ham an early lead, Newcastle hit back through Henri Saivet, Mohamed Diame and Christian Atsu. Andre Ayew responded in vain for West Ham, having earlier squandered a penalty. Pascal Gross’s fourth goal of the season earned Brighton and Hove Albion a 1-0 win at home to Watford, while Laurent Depoitre cancelled out Charlie Austin’s opener as Huddersfield Town drew 1-1 at Southampton. The post Man City claim 17th straight win, Kane equals record appeared first on Vanguard News.